Now do ones for the solo albums, too, and the Anthologies! :-) I can't get enough of these guys. Best of All Time, hands down. Their music never stops inspiring me. Solo albums? John Lennon/Plastic Ono Band...Band on the Run...Cloud Nine...Walls and Bridges...Tug of War... Stop me! Quick! You would also have to be locked up in some Arkham style when you became a BEatles themed super-villain, when you have the basic problem of having the Beatles compared to the Rolling Stones and Yardbirds. It will be a world shattering experience. And your obsession may, MAY rival the Ridler and Joker's with.. well riddles and jokes. Will you be the Beatler? Anything to bury the truth, here comes... THE BEATLER. Smashing Rolling Stones albums everywhere in the name of the cover-up! Hey Jude has always been my favorite Beatles song! 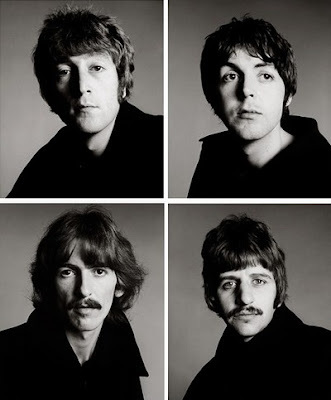 I wasn't born until John was killed but I still realize the "fab four" were some of the greatest musicians ever. And though I'm sad "Yesterday" didn't make your list, I do agree with most of the rest. That's the beauty of the Beatles: the songs that get left off one person's list could end up at the top of another person's list. Such an amazing catalogue! Strawberry Fields Forever is my favorite Beatles song. That could easily be #1 on the list. In fact, I pondered put it in that position. It's an utterly brilliant song and game-changing production. Your mention of some dismissing "All You Need is Love" as hippie claptrap made me think of a comment by Theodore Roszak in the new introduction to the 1995 reprinting of his seminal "The Making of a Counter-Culture" -- "Some poke fun at slogans like 'Make love not war," but it was a fine, gentle sentiment, and at the time a brave thing to proclaim." He adds that one reason so many who otherwise love much of what the 1960s created culturally & politically, but who mock & reject the hippie ethos all the same, is that embracing a credo like "All you need is love" requires more vulnerability, openness, and trust of others than many people are willing to risk these days. And as true as that was in 1995, I think it's even more true today, in the age of glib irony & snark. I totally agree with Roszak and with you, Tim. And thanks for expressing that so beautifully. "Dear Prudence" is another big favorite of mine—one of those tracks that gets even better as the years pass. And "Because" features the most beautiful singing John, Paul and George ever did together: those layered harmonies are just off the charts. And it's just a gorgeous song, to boot. He lived by the motto, "I think I can, I think I can"
You are clearly the Weird All of the comic book set, David! Song parodist supreme! Actually, I love "Bungalow Bill"—just not enough to put it in my top twenty. That should have been Weird Al...it got auto-corrected! Weird All sounds like a cool new cosmic threat for the JL 3001! I probably wouldn't put "Bungalow Bill" in my top twenty, either. "Happiness is a Warm Gun" covers the same themes, but does it better. I'd definitely have "While My Guitar Gently Weeps" and "Elanor Rigby" somewhere in there, though. Two superb songs. If I had a dime for every time I played "While My Guitar..." back in my musician days, I'd...well, I'd have a lot of dimes!